Sketchup is a free design program that's perfect if you want to work on architectural designs with none of the hassle. Working with design applications can be a complicated and burdensome task, but not when it comes to Sketchup. This free software allows you to create designs for architecture, mechanics, video games and much more while remaining intuitive and simple to use. 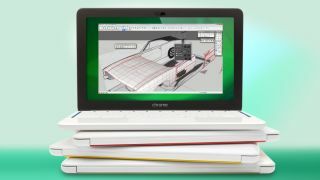 The software's creators say they aimed to recreate the freedom of working with a pen and paper in a computer design package, and it comes loaded with tools for drawing, modifying, rotating, scaling and moving geometry. Whether you want to create a new home or design your dream car, Sketchup has the tools to get you on your way. It's got an unbelievable number of features for a free program. It's stacked with free resources to add into your work like trees, cars, doors and textures, while you can import all manner of 2D images and 3D models. It's great for visualising your work, too, allowing you to create walk-throughs, presentation tours and simulate camera placements. And if you're looking for more, Sketchup has an extensive plugin library in its Extension Warehouse, containing plugins that expand the range of files you can work with, check your designs for errors, provide near photo-realistic rendering and more.